【 Mini Size Clutch 】 5.5inch*4.5inch/ 14cm (L) x 11 cm (H) ;Strap Approximate Length: 5inch .Big enough for most of your daily stuffs , iphone5 /5S/6(Under 5.5inch Size ) ,credit card, cellphone, ID, lipstick. 【 Premium Rhinestones Materail】 Made of high quality full soft dazzling rhinestone and fabric lining ,with zipper can be opened and closed smoothly will more attractive. 【Best GIFT Ideal for Female】 This exquisite bag conform to all fashion elements, And we also think it will be a perfect for Wedding/ birthday / adult gift to your wife, lover, daughter, or other important person. 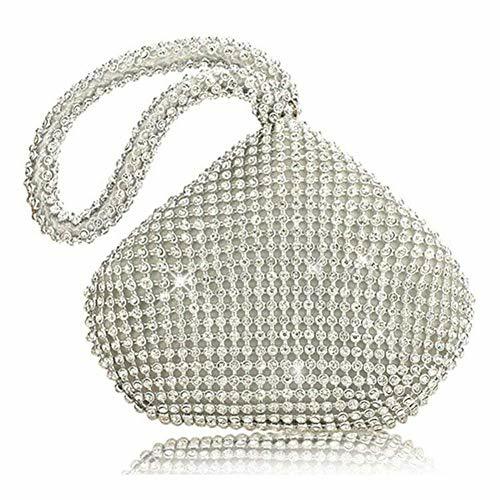 【 Fits Occasion】 The evening little bag elegant design with sparking beadings, silky satin lining ,special formal occasions or important moment of life or business, like wedding, engagement, social Activities. from make-up, hair style, dress, shoes,necklace, clutch and other accessories, it will be never too choosy to capture every best time.